Upright Video Arcade Game Machines, Nationwide Shipping, AGS of Maryland, Washington D.C., Philadelphia, Virginia, Pennsylvania. Check out some of our competitive prices below or call to price your game. The list to the right represents some of the more popular games that we have sold. Don’t worry if your game is not listed, we can almost always deliver the game you are searching for. Why Buy an AGS Refurbished Game? 1) The Overhaul: Our reconditioned games are completely shopped out with new T-molding, artwork, buttons, joysticks, trackballs, wiring harness, new circuit boards when possible and new or completely rebuilt monitors. 2) The Warranty: Our reconditioned games come with up to a 2 year warranty! You'll find that our used game warranty beats many of our competitor’s new game warranties! 3) The Price: Our reconditioned games are thousands of dollars cheaper than many competitor’s new games and in most cases come with a better warranty. 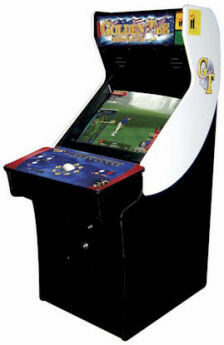 Arcade Legends + Golden Tee Fore! 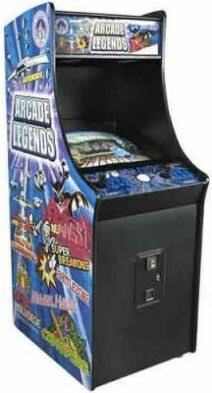 = Arcade Legends 3! The greatest collection of Arcade Games ever amassed! 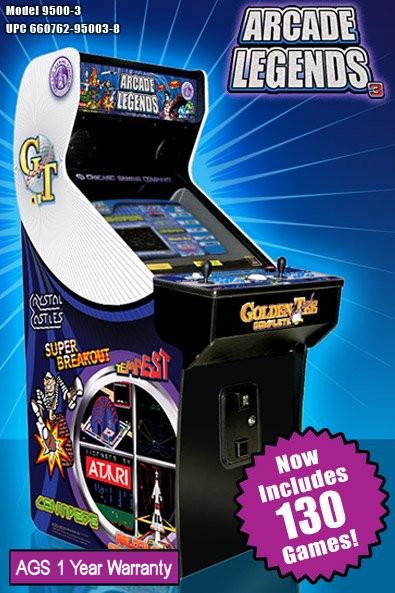 The huge collection of Arcade Legends games plus all 29 award winning Golden Tee Fore! Complete courses, all in one cabinet. 135 games in total! The custom menu sorts game titles by name, manufacturer and favorites, allowing the user to quickly navigate the 135 titles. Highlighted games are previewed and the user is provided a brief tutorial once a game is selected. Authentic Arcade Hardware - Arcade Legends utilizes real arcade controls, including one trackball, two joysticks and fifteen buttons for 2 player simultaneous head to head action. Expansion packs now available adding 30 games for 165 total! Games include 1942, 1943, Street Fighter II and Double Dragon. NEW Price $2,995 - Recently released, only available new. AGS adds a 1 year warranty covering all electronic and mechanical components! Pacman's Arcade Party By Namco. Finally, a full size upright multi-game arcade machine with many of your favorites from the early 1980's classic game era. Games are selectable with an on-screen menu. Comes in free play or coin operated version. This machine is available in an upright as well as a cocktail table version. Game list includes: Pac-Man, Ms. Pac-Man Galaga, Galaxian, Dig Dug, Rally X, Mappy Xevious, Bosconian and many more. Call for details! New Game - Comes with AGS 2 year warranty. Please Call for pricing. Ms Pacman & Galaga By Namco. 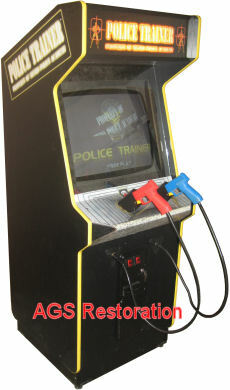 New Game Price $2,995 - Now back by popular demand, this brand new machine comes with an AGS complete 2 year warranty. Free Play Only. Like New Price $2,195 - - Low use version of this game in near flawless condition. Comes with AGS 2 year warranty. Coin-op or free play. Only 1 Left! Used Price $1,695 - 1 year warranty. Call for details. Multi-game where you choose the games you want with many game packs available. Legendary arcade games, authentic in every detail. 125+ games available to choose from. Expansion upgrade packs available. Can be set for coin-op or free play. For the ultimate GT experience... 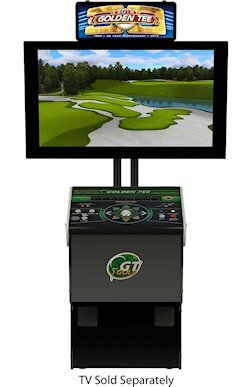 The latest and greatest version of Golden Tee Golf with high res graphics and 67 courses! Come in and test play it today. Excellent Condition $3,295 - Refurbished Upright 2019 unit in very good condition. Comes with AGS 1 year warranty. In house delivery available. Brand New $3,895 - Brand new pedestal unit from the factory. We add on our AGS 1 year warranty. In house delivery and nationwide shipping available. Pacman Ultimate arcade game in the Universe. Full size upright arcade machine. The most popular and well known arcade game of all time! Condition - Fully Restored. 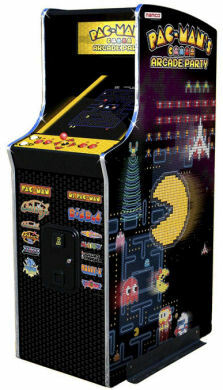 We take an original pacman and restore the outside using the original pac-man colors you remember. Then the inside is brought up to modern standards with a rebuilt monitor, all new controls and internal electronics. Reconditioned Price $1,395 - Comes with AGS 1 year warranty. 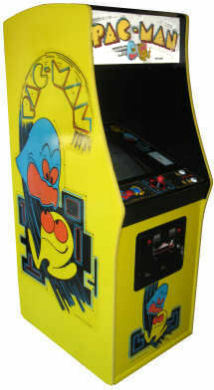 Like New Price $1,950 - Same game in a fully repainted Midway Original Cabinet. 2 Year Warranty. Rebuilt perfect picture monitor, all new controls and control panel, repainted metal surfaces, new power supply, wiring, many new components. You can't find many others that redo them like this! Popular coin operated shooting game with 2 guns for awesome 2-player fun. A target shooting game for one or two players that pits a task force against a terrorist group. Non-stop action with 3 missions and over 35 secret rooms. Wipe them out! All of them! 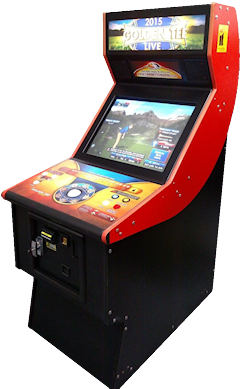 Reconditioned Price $1,450 - We have fully refurbished original versions of this game in excellent condition with a 1 year warranty. Non-violent, popular coin operated shooting game. with 2 guns. Players shoot at still and moving targets in an elaborate police academy style training arena. Advance in rank as you successfully complete each stage. Very fun 2-player game. Condition - Meticulous restoration, game looks like new. 1 year warranty. Don't struggle to keep an old Williams game going. This multigame has all of your favorite Williams classics including: Defender, Stargate, Joust, Robotron, Bubbles & more. No worries mate, the buttons and joysticks are positioned properly to give each specific game the same feel and game play as the original Williams machines. You will not get this same feel from the "streetfighter" button layout of other multigames such as Arcade Legends. This is the best reliable choice for Williams game fans! Local in-home delivery or nationwide shipping available. Call 410-310-8852 to order. 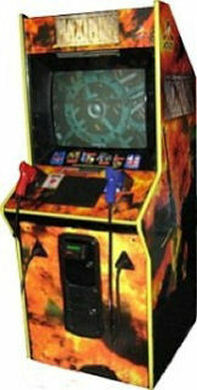 Coin Operated Arcade Game with as many as 29 courses depending upon the version you select. This is the commercial version seen in bars, coin operated or free play settings. One of the best golfing games ever made and definitely the most popular. Condition - Fully Restored. New control panel, T-molding, new track ball, rebuilt monitor, resurfaced sides, looks like new. 1 year warranty. "This classic game, is now The Ultimate Gift in The Universe." It is fully restored, completely rebuilt Ampliphone XY Vector monitor. Immacculate side art and new t-molding, title marquee, scratch free tinted monitor glass. You won't find one in this good of shape elsewhere with a one year warranty! Your not sure? We find your lack of faith disturbing, so call to discuss. Condition - Fully Refurbished, 1 year warranty. Other classic complete restorations available. This is the original release in the very popular Cruisn series of driving games. Gameplay involves racing through various tracks throughout the USA . One of the other cars may be controlled by another person if two machines are linked. Condition - Fully Refurbished. Rebuilt digital monitors installed, new t-moldiing, painted surfaces have been restored, overall excellent condition.1 year warranty. 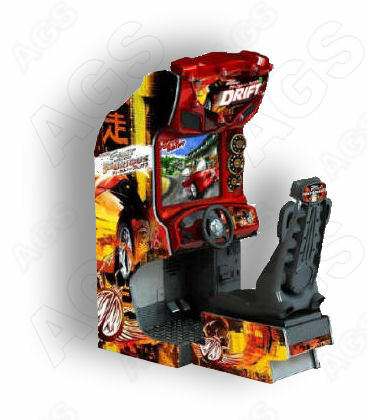 Popular coin operated driving game with realistic steering feedback. Race across various cities throughout the world against a wide variety of other cars. One of the other cars may be controlled by another person if two machines are linked. Condition - Fully Refurbished. New or rebuilt monitor installed, new t-moldiing, sand and paint dash contol panel, excellent condition. 1 year warranty. A very fun driving game with realistic steering feedback that features several tracks including one that has dinosaurs and several different cars including an old rusty chevrolet station wagon.The object of the game is to race through twelve tracks spanning earth, underwater, and on Mars. There are many new cars and drivers including a clown and an alien. Great sounds and fun. 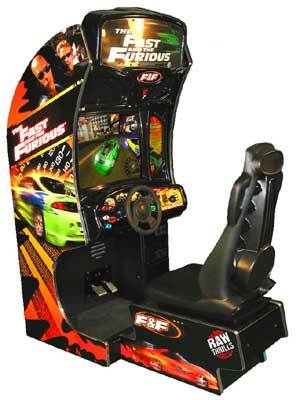 One of the best in modern arcade driving games with a lower comparable price. 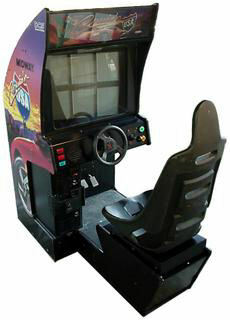 This is the dedicated (original) version (not a converted cruis'n, etc) Features a realistic steering feedback system and high resolution VGA graphics. Condition - Fully Refurbished. High res monitor, new t-moldiing, all painted surfaces refinished, excellent condition sideart, excellent overall condition. 1 year warranty. 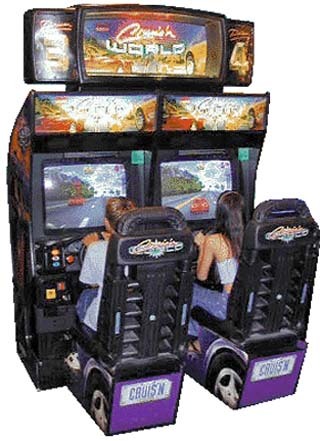 The Ultimate in arcade Driving Games. This is the dedicated Drift Version (not a converted Fast and Furious.) 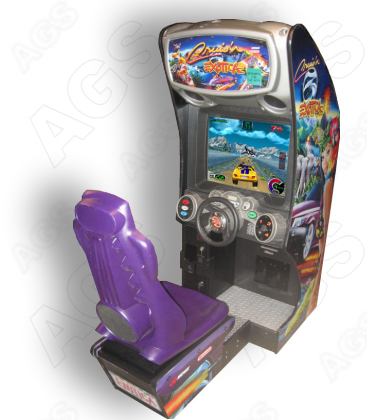 Features a realistic steering feedback system and high resolution VGA graphics. Condition - Fully Refurbished. Rebuilt high res monitor installed, new t-moldiing, all painted surfaces refinished, excellent condition sideart, excellent overall condition. 1 year warranty. We sell many upright video game machines not listed above. If you are searching for a specific video arcade game or multigame not pictured on this site, please inquire about it here. If it's not made in a garage somewhere, there is a good chance we carry it! 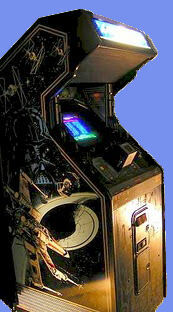 AGS Tip: Beware of MAME type machines playing "1000's" of games. These are 'computers in a cabinet' & simulate the original arcade games. Depending on the source, they are often loaded with glitches, jumpy video, incorrect sounds and playability issues. Delivery: We specialize in Nationwide Shipping as well as in house delivery via truck to all of Maryland, the DC Metro Area, Philadelphia, Virginia, Pennsylvania, New Jersey & Delaware. Rates as low as $75 are based on distance and difficulty of installation. Delivery is free within our immediate local area! Warranty: Warranties cover all mechanical and electronic components of the machine. Lifetime tech support there after! Arcade Game Sales, Your Arcade Game Source! Copyright © 2018 AGS Arcade Game Sales of Maryland. All Rights Reserved. © 2011 Joetronics.